Today, May 20, is the Don’t Talk-a-Thon for Project ALS research. I am participating and donating to the cause to honor people like Ben, who lost their ability to speak because of this cruel disease, and to contribute to efforts to fund critical ALS research. 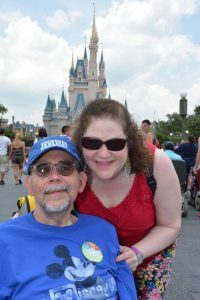 Just last week, I wrote about how The Little Mermaid reminded me of how Ben struggled as his speech left him as a result of the progression of ALS. Much of this bears repeating. It is devastating, and deeply personal, to elaborate on the impact of losing his speech, on him and on me and others who loved and treated him, but I feel very strongly that sharing these details helps to convey the physical and emotional effects of ALS and the urgent need to find a cure. Ben was fortunate that his speech was very slowly affected. However, as the impairment grew, so did the ability to understand him. Since I communicated with him so much, I was better able to figure out what he was saying. However, phone conversations were extremely difficult. That added a lot of stress because Ben was alone when I went to work. When he finally agreed to having a medic alert device installed, there was a fear that if he activated the alarm, the response team would not understand or hear him through the speaker. Fortunately, the team also notified me if the alarm was activated, and I could run home. Think of times that you have tried to explain yourself but your point was not understood. Frustrating, isn’t it? Imagine a day full of that. Imagine constantly feeling that. It’s not just the difficulty moving your mouth muscles and using your voice. It’s being understood, truly heard, feeling like you matter. ALS takes that away. Watching someone struggle and surrender, because they just don’t want to keep trying to express themselves, thereby losing their sense of self, is painful. It was when Ben had a respiratory crisis that we were both truly frightened by his inability to speak to me. He said very quietly that he was having trouble breathing, which he sometimes said out of anxiety. However, this was the first time that he was having extreme difficulty speaking, so we could not talk it through, and I had to ask him to blink if he wanted me to call 911. This event landed him in the Emergency Room at Mount Sinai Medical School. He was given a Bipap mask and I tried to read his lips. Suddenly, teams of doctors approached me, talking about moving ahead with a feeding tube and tracheostomy. These were things Ben had always said he wanted. Just the week before this crisis, Ben had spoken to his doctor about making arrangements for the feeding tube, so this was not a shock. However, seeing him with a Bipap mask on a ventilator, and knowing that the tracheostomy was imminent, was terrifying. Once in the hospital, Ben began to rethink his choice and wanted to have the time to make a firm decision. Doctors talked to me about the need to devise a plan for communicating with him. We had not really considered these options because until this point, a tracheostomy was something to happen down the line. I called my local ALS chapter for advice and was told about communication boards where I could point to letters and commonly used words to help Ben express himself. I brought in paper and markers and made a chart with all the letters of the alphabet. I tried pointing to the letters so Ben could spell out words one by one. It was tedious, frustrating, and tragically sad. Ben hated it. He spelled out a little and then shook his head and stopped trying. Who could blame him? He wanted me to read his lips, but with the Bipap mask, his mouth was obscured. Also, his mouth muscles were not always cooperating, so reading his lips was not always possible. His doctor suggested a new strategy of asking if each word started at the beginning of the alphabet, A-M, or the end of the alphabet, N-Z. Based on this, we literally recited the alphabet until he nodded that we hit the right letter. Imagine spelling an entire sentence like this, and then having an entire conversation like this. Sometimes Ben got frustrated that I said the alphabet too slowly, he understandably lacked the patience to spell the words out. Ben did prefer that we try to read his lips, and we tried. Since I was with him so much, it was somewhat easier for me to figure out what he was saying, but it was not always possible. There was very little small talk. A long blink was his way of sending me a kiss. In the hospital, there was also no ability to call or text him. And, there was no ability for him to call for help in the hospital. People wondered why I spent 16 hour days in the hospital, and stayed over at his request, but it terrified me as much as it did Ben that he could not call for help. His hands did not allow him to press the call button and the variations of the call button also did not work. The nursing staffs really were great and they did stop by frequently, but I know that I will never fully be able to understand the depth of Ben’s fear and feeling of helplessness. They were very patient with my phone calls and requests. Ben was at least fortunate to be able to nod or shake his head as they tried to determine his needs. Many with ALS are not. Basic conversation was challenging enough, with Ben having to spell out the simplest of requests, like blankets or asking me to play a specific playlist on his iPad. But, Ben was also making very serious decisions about how he wanted to proceed in life and death with ALS. I will never forget the meetings with his medical team where they discussed his options: life with a tracheostomy and ventilator at a facility or hospice. I took a photo of it and texted it to his daughter, who shared it with the rest of her family. I felt that rather than my conveying a message, she should know her dad’s exact words. I don’t really know why I kept this horrible message, but I simply had to. Once he decided to go to the palliative care/hospice unit of the hospital, we had to choose the day that he would separate from the ventilator. I remember him spelling out for me, “When is a good day to die?” It broke my heart to write that and to have to grapple with that. Try to imagine what it must have been like for Ben to tediously spell that out. I still can’t. You can’t either. I’ve said it before and I will always stay in awe of his bravery. In his last days, I did try to read his lips as much as possible. On the morning of the day that he left us, he asked to say our vows, and he mouthed them and his, “I do.” It is heartbreaking to think of it, and yet, it gave him joy, and it does give me joy to know that he had a beautiful last day filled with love and music. 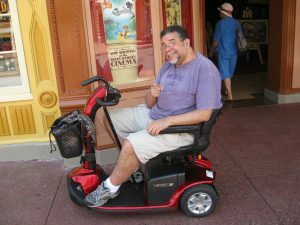 I share this with you because learning about the actual experiences of people with ALS and their loved ones is, in my opinion, the most heartfelt and accurate way to begin to explain the tremendous cruelty of ALS and the very specific ways in which it affects patients and their loved ones. Ben was fortunate to have had his voice for five of the nearly six years that he battled ALS, even though it was impaired. His physical voice gave him an emotional strength. When he lost the ability to be heard, he felt invisible and terribly vulnerable. Many people with ALS lose their voices very quickly and live with that feeling for several years. The Don’t Talk-A-Thon asks people to take a vow not to use their voice for at least an hour. Just an hour. Think of the trivial things that we often say over the course of an hour. Think of the many silly texts we send over the course of an hour. Those are luxuries for someone with ALS. But, those little things convey who we are and envelope our personalities. ALS robs speech but we cannot allow it to rob dignity. As caregivers, family members and friends of people with ALS, our patience, creativity and compassion helps people with ALS have a voice and feel significant. By supporting ALS research through efforts like the Project ALS Don’t Talk-a-Thon, we can be the voice for people with ALS, and contribute to efforts to find a cure. If you would like to learn more, participate in, and/or contribute to the Project ALS Don’t Talk-a-Thon, please click here. 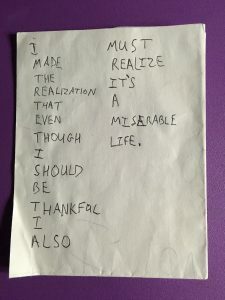 I thank you for reading this post. A Mother’s Day Tribute- The Women Who Showed Me the Caring In Caregiving	Happy Birthday, Goofy!